Bristol Cycling has obtained the police’s latest figures for road collisions and incidents resulting in the injury of vulnerable road users in 2017. 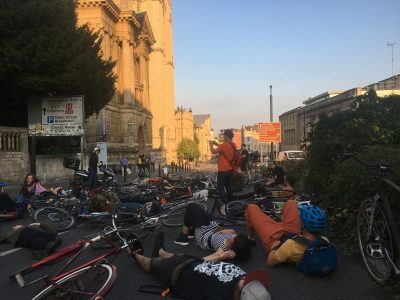 They show that 191 pedestrians and 232 cyclists were recorded by the police as being injured on Bristol city’s roads. But we know that these figures massively under-record the true level of injuries – using Department of Transport research we know that the true figure for injured vulnerable road users is well over 1,000 people. And this is just for the Bristol city council district – not the larger Bristol conurbation extending into S. Glous and Banes. Dozens of these people will have attended A&E or their GP. So we also obtained the official figures for hospital admissions. These reveal that 30 cyclists had to be admitted to (i.e. kept in) hospital because of their injuries. Yet the police recorded only 16 serious injury collisions. In 207 cases (89% of the total) no further action was taken by the police. Future Temple Quarter – will there be lots of cycling? Want Space for Cycling in Bristol? Support Bristol Cycling Sign me up!